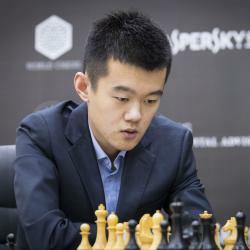 The highest rated player of China and two time Olympic Champion, GM Ding Liren is a force to reckon with and proclaimed by many to challenge for the world championship title. In September 2018, Ding became the first Chinese player to cross 2800 mark on the FIDE rating list and in November he reached a peak rating of 2816, the joint tenth highest rating in history. He is currently ranked number 4 in the world with 2813 Elo points (December 2018). He is known for his versatile style and being extremely hard to beat and he is also well known as a fierce Blitz player and in July 2016, he was the World’s highest rated Blitz player. Ding Liren (Last name is Ding) is a chess prodigy who fought for the World Youth Championship titles starting from Under 10 category in 2003. He then became a Grandmaster at the age of 17 in 2009, following which he won the Chinese Chess Championships thrice in 4 years. Later, he topped that by winning the World Chess Olympiad twice with China in 2014 and 2018. In September 2017, he finished second at the Chess World Cup and thus becoming the first Chinese player to qualify for a Candidates tournament, where he was the only undefeated player. Ding continues to be the Chinese and Asian number 1 for more than a year now.